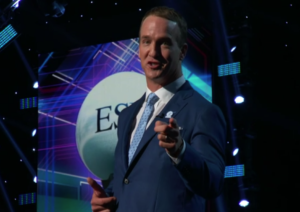 Peyton Manning hosted the 2017 ESPY’s (the annual sports awards show) handing out awards to Russell Westbrook for best male athlete, Kevin Durant for best championship performance, the Golden State Warriors for best team, Simone Biles for best female athlete after her 4 gold medals, and the Chicago Cubs (for best moment) by winning the World Series after 108 years. For the full list of winners, click here. Peyton Manning hosted the show, and in the opening took some barbs against Kevin Durant, joking he should join the women’s winning gymnast team because they’re so dominant. KD did not look pleased! The Lakers’ Lonzo Ball had his best game of the summer league. Against the Philadelphia 76ers, Lonzo electrified the crowd (including LeBron James) by posting 36 points, 11 assists, and 8 rebounds and 5 steals. Lonzo noticeably wore Nikes instead of his $495 Big Baller Brand shoes.